On a surprising turn of events, yesterday I found myself relatively free. Attending a function at a relative's office can be quite... well not so entertaining. Sitting there and staring at people's faces and the funny things pandit's do can definitely give time to a person to think. Another surprising event - I was able to stop worrying about work and accounts and accept that whatever happens, I'll be able to somehow manage. Both surprises together gave me ample time to think and ponder about the state of my life, its direction and the state of people in this worlds or atleast here in India. While the direction and state of my life is a whole other novel, in this post lets focus on the state of atleast some people in India if not everyone. So what do I think? Lets face it, with my generation & the incoming generation, the virtue of patience has deroded. Everyone today wants things now and immediately. What normally would take 5 years, they want it in 2. While the need to be speedy is true in some areas like starting up a company and stabilising it with regular revenues. At the micro level or an individual level there is still need to be detail oriented and have the patience to think, analyse and execute properly so as to ensure a complete and proper execution. Any execution which is very speedy will not be thorough enough and will need a 3nd round of execution which will degrade its value and the people involved will also get bored. Most things today are superficial in nature. For e.g. the MBA course. Its target population was present after the world wars and during and after the cold wars when people were experts in their fields with little management experience. The course is designed to teach a management overview so as to make them quick managers and enable them to pick up required skills on the job. Today this course is obsolete. The people doing this course are not experts in any field resulting them in becoming poor managers as they manage a team of people doing work they know nothing about. One cannot manage effectively and optimally unless one knows the field in and out. Which is why every Founder of businesses surviving 5years or more are very effective in managing and performing as they spend enough time understanding the depths of their product/service and the target markets. What people need to learn today is to have patience, and to keep at it and learn more and more. The 1st 3-5 years of a perons' career life should be spent working in and learning one field or domain. Be it coding, marketing, music, directing, acting etc. It is only after you know the field at depth that can you as a manger contribute optimally to it. The current societal and corporate structure is optimal from the sense of office productivity and optimal profit levels, but it is a model which is unsustainable. It will become sustainable, only when society allows individuals to have enough time to learn and become experts and develop intrinsic skills to benefit companies and the society in a larger sense. And when corporates stop demanding individuals to spend 90%-100% of their life and time at work and allow people to grow at an individual level as a person and as well as a resource. Society will soon break down if we continue at the current speeds at the micro-level. The impatience of being better than the previous year and the previous generation is already eating up people and everybody wants things to change for constant growth. Sustainable growth is possible only through patience, planning, perseverence and hard work. There is no solution or medicine that one can drink and learn everything. Similarly none that one can drink and become successful. Success comes to those who remain patient and persevere- trying, learning and experimenting all the time. Whenever you do some work or task. Take a moment, think about what is required and how to get it. Think about what problems you can face and how you should counter them. On finishing, take another moment and do a thorough check of the work done ensuring there are no mistakes. (1) this allows for perfection (2) learning on what all went wrong and how to fix (3) understanding of what is being done, why and how to do it better. We are all humans and humans tend to make mistakes more often than not. A thorough re-check will allow for proper execution and time to think on what was done, why and how to improve. So please, work in what you are interested in and dont jump from domain to domaain. Spend a few years working in the same field and get exposed to possibilities. Practice makes perfect, it also makes experts. The offline world moves online and the buyers shift to purchasing items in cyber space. Selling was more about advertising the presence of a shop and the availability of products in the area. Online shopping is turning out to be a boon for everyone. You can now shop from home / office. No longer must you travel from place to place in serch of a shop and from shop to shop in search of prices. Searching though google gives you a long list of online websites. Advertising has now also become easier. Banners all over the net on all types of websites spread the awareness and build the brand for the shopping websites. After Flipkart opened doors 7 yrs back, many other companies have now come up. Mostly marketplaces though as that model seems to be working in India at the moment. Indians want a sign of trust from the seller still. If a 3rd party provides a guarantee Indians are ready to buy. One of the things Indians love is a good deal. Paying a price less than what the market value really is. What used to be local ads and discounts have now gone online by way of coupons and discounts. Coupon sites have now come up which list down the coupons and discounts offered by these online e-commerce companies. Startups like Coupondunia, 27coupons, CouponNation, Pennyful and Cashkaro among others dominate the coupon distribution space. Recently we wrote about Cashkaro growth. The Gurgaon-based startup had driven sales of Rs. 25 crores for its partner retailers in the past six months. According to a study by CupoNation, close to 85% of Indians used vouchers before online shopping. “This explains why the Indian market for online coupons already accounted for more than $2 billion in 2013 and is expected to grow by further 30% by 2017,” adds Sharique. The study reveals that over 70% women use CupoNation vouchers to buy fashion, jewellery and shoes while 67% of men are using travel and electronics coupons. 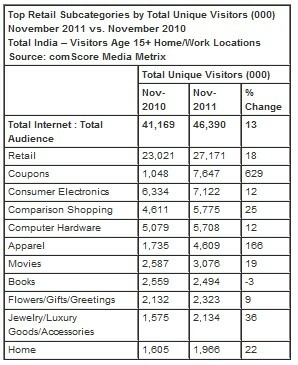 The below Comscore report shows the growth in unique visitors on websites from 2010 to 2011. The visits have been growing since then. The number of searches for coupons has been growing every year hitting a max of 82K a month in Dec 2013. The growing trend shows that more and more people are now searching and buying online. Being Indians we cant help but look for great deals. Tradus.com is one such company. Its a marketplace with many many products. Its has apparels for men and women, home decor, kitchen products, footwear, watches, mobiles, computer, beauty products, grocery and even cars and bikes. With such a wide range of products and providing a guarantee of delivery, Tradus is on its way to becoming one of India's topmost e-commerce websites with such a wide range of products. They also have tonnes of discounts running and all of you should search for Tradus coupons and get awesome discounts to buy at an awesome store.